“Nature photography is a huge favorite hobby of mine. Our home is filled with images from our travels near and far. This is something I have passed on down to my children and they all enjoy photography in their free time. I want to push my skills to the next level this year and in order to do that I have made myself a Nature Photo of the Week challenge. I will be taking photos each week to go along with a determined theme. At the end of the year, I will take my weekly photos, choose one from each month, and then use those images to create a customized family calendar for 2015. I am happy to share my Nature Photo of the Week Challenge with any of you who want to play along. I have created a printable list of topics that you can use in any order you wish. I also have started a Pinterest board where I will pin my images and I invite you to as well. You need to follow the Pinterest Board before I can send you an invite. 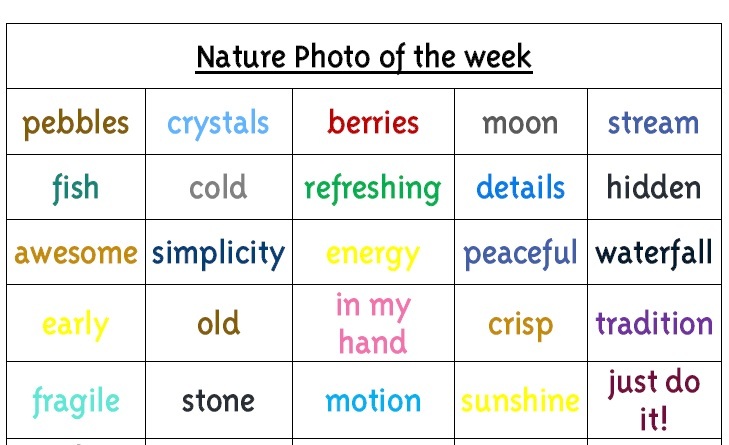 My kids love capturing their nature study finds with a camera, so this challenge was right up their alley! And with my smart phone, I can so easily snap and upload photos to the Pinterest Board. You will also notice the Nature Study February Fun grid on the clip board. Again Barb of Handbook of Nature Study encourages children to enjoy Nature Study with The Handbook of Nature Study with her Outdoor Hour Challenges. Each month she provides subscribers her OHC newsletter with articles, links, downloads and nature study activities according to season or theme. 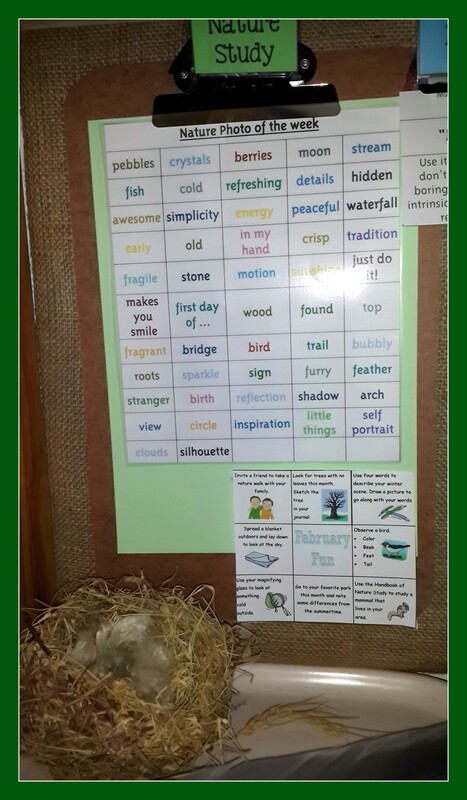 The monthly grid (a lovely visual reminder) pinned up and on display encourages my children to get outdoors and observe, collect, journal or photograph. And it doesn’t take an hour – just a short outing! The next week, I clear the tray, putting on our nature shelf the things we want to keep and discarding the rest. Sometimes I grab some leaves and put them in the leaf press, between sheets of contact paper, or into someone’s journal with tape if he or she requests it. Rocks, sticks, bark, and feathers either go into our little collection or out into the backyard for play. And the tray is then wiped down, ready to be refilled with a new set of treasures after our next outing. In a way, this holds me accountable too: I don’t like to clear out the tray until I have had time to document and sketch a bit, but the tray must be emptied to make room for our new finds. So through the routine, I’m nudged into at least a weekly journal entry. This seems like such a minor tip–perhaps this is something you already do! But if you’re anything like me, it’s little things, those easy habits that allow the “extras” to become smoothly woven into the rhythm of our days, that make all the difference. Sometimes, when I’m having a busy week and I would normally be tempted to let our nature study slide, it’s this little habit that prods me to get out the colored pencils and notebooks! This is a wonderful idea, Celeste! Older children, homeschool graduates and parents can use the very enthusiastic younger children’s nature collections as a stimulus for nature journaling! No excuses for not doing nature journal entries! As you can see, Nature Study is simple, easy and delightful! Charlotte Mason encourages moms to also spend time outdoors with their children and simply observe and enjoy their children’s delight in nature. This time is an investment in “Mother Culture” because, for an hour or so, you can forget the hum-drum of life and household chores! Schedule in this “extra” in your week ~ see my “Theme of the Day” chart. i enjoyed reading your entry!